I have made a folder on my PC running on Windows XP to store some important documents related to a court case. As my PC is used by multiple users, I wish make that folder as private. How can I do that? You should first of all log on to your PC and right click on the folder you want to make private. Then, you should click on the ‘Properties’ option from the available items. You can then view a dialog box with three tabs on it. You should click on the ‘Sharing’ tab from them. You should then select the check box near the ‘Make this folder private so that only I have access to it’ option. After that, you should click on the ‘OK’ button at the bottom of the dialog box. Then, you will be asked to enter the password for logging into the Windows for accessing the private folder. You can make your folder private by entering the password at this moment. Finally, you should login to Windows with your usual password and confirm that the private folder is not accessible. 2.Double-click on the drive where windows installed (usually drive c .
3.Double-click on the DOCUMENTS AND SETTINGS folder. 5.Right click any folder in user profile,and then click PROPERTIES. 6.On the SHARING TAB ,select MAKE THIS FOLDER PRIVATE SO THAT I CAN ACCESS to it check. Double click on the C drive. If the content are hidden then make them visible by System tasks and then clicking Show the contents of this drive. Double-click the Documents and Settings folder.Now Double-click your user folder. Right-click the folder in your user profile which you want to make private, and then click Properties. On the Sharing tab, tick "Make this folder private so that only I have access to it" check box. there are many more option by which you can hide your folder. you may make a different user account & can store important notes to my documents. right click on the folder you want to hide. go to general tab & tick on the hidden option. go to the 'folder' option in any window (open any window look at the upper left side of that window). select the 'view' option tab. now tick on the 'don't show hidden files & folders' option. you may also hide a complete drive-there are many tricks. but I think the above mentioned trick will be enough for you. to make a folder private you can either "hide" the folder by going into the folder options ..
you can even put folder lock software and lock the folder indeed . .
you will have security and safety provided to it . .
2. Double-click the drive where Windows is installed (usually drive (C , unless you have more than one drive on your computer). If the contents of the drive are hidden, under System Tasks, click Show the contents of this drive. 3. Double-click the Documents and Settings folder. 4. Double-click your user folder. 5. Right-click any folder in your user profile, and then click Properties. 6. On the Sharing tab, select the Make this folder private so that only I have access to it check box. You folder be private only if other users dont use your LOgin account , it means they use another account. So, make sure other users have different user account. Click the Sharing tab, and then click to select the Make this folder private so that only I have access to it check box. My Documents is not accessible. Access is denied. "Making folder private in Windows XP would restrict others from accessing that private folder. It would also disable folder sharing feature.1) Open your Windows Explorer and locate the folder which you want to set private. Right click the folder and click Sharing and Security. 2) Your folder Properties will appear. Select Sharing tab and tick Make this folder private, so that it can’t be accessed by others. Finally click Apply. Note: This option is only available for folders included in your user profile. Folders in your user profile include My Documents and its subfolders, Desktop, Start Menu, Cookies, and Favorites. If you do not make these folders private, they are available to everyone who uses your computer. Note: When a folder became private, all of its subfolders are private as well. Note: When a folder became private, you can’t share the folder and subfolders till you disable this private folder option. Note: You cannot make your folders private if your drive is not formatted as NTFS." Now you are searching for set up the your folders private, then you don't worry you can private your folder by following instructions mention bellow step by step and this process is very easy..
First of you need to turn on your computer. After that you need to select the folder you wish to encrypt. Now after that right-click the folder. After that check the box make this folder private. Finally you need to click on the apply and then click on the ok button and after that if any body open this folders it should be empty now. STEP 1: Open Windows Explorer and Right - Click on the Folder which you want to make it as Private. 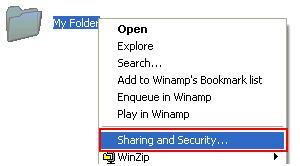 STEP 2: Select "Sharing and Security". STEP 3: Window "My Folder Properties" will appear and Click on the "Sharing" Tab. STEP 4: Check "Make this Folder Private". STEP 5: Click on the "Apply" Button and "OK" Button. Log on to Windows by using your user account. In this Right-click the folder, and then click Properties. After create a folder select the folder and right click on it. In general tab u can see a hidden options,chalk in it. Now go to folder options under the organized button in any window. Now make sure that ur u have chalk the options"don't show the hidden folders"
Right-click the folder which you want to private and then click the Properties. - Double-click on the DOCUMENTS AND SETTINGS folder. - Right click any folder in user profile,and then click PROPERTIES. - On the SHARING TAB ,select MAKE THIS FOLDER PRIVATE SO THAT I CAN ACCESS to it check.